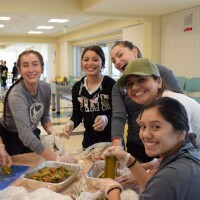 Generals for Justice works to promote the dignity of all people through service projects, fundraisers, and by increasing awareness of social justice issues. We encourage students to deepen their commitment to being "Men and Women with and for Others" by serving as Jesus served. We are challenged to "heed the call of the Gospel to effect change and see service as a gift to self, not only to others".